These two items appeared separately in the original version of the Around Naples Encyclopedia on the dates indicated and have been consolidated here onto a single page. I'm reading another one of Howard Marraro's interesting books (also see here), this one entitled American Opinion on the Unification of Italy, 1846–61, first published in 1932 (frontispiece, photo). He stitches together and comments upon newspaper items, magazine articles, pamphlets, and speeches and messages of American public figures from those years to show what the public in the United States felt, generally, about the broad issue of Italian unity and, specifically, how it reacted to the conquest of the Kingdom of the Two Sicilies by Garibaldi. Also, I strain to believe that any southerners after the Civil War would have appropriated Garibaldi's name or symbols to their lost cause. Surely, they knew that Lincoln, in 1861, had offered Garibaldi the position of a general in the field for the Union armies, and that the reasons Garibaldi turned Lincoln down were (1) that Lincoln wouldn't make him commander-in-chief (Abe already had that job) and (2) that Lincoln wouldn't let him free slaves wherever he found them during his military campaigns. (Invading plantations and liberating slaves in South America had been one of Garibaldi's favorite things to do during his younger days, when he was abroad and training for the big fight). The journal is in large tabloid format, 8 large sheets folded into 16 pages of newsprint. The front cover displays a woodcut of "General Giuseppe Garibaldi [from a recent picture]" posed heroically astride a horse. On the inside pages, there are other illustrations of the bay of Naples, Messina, and a map of The Kingdom of the Two Sicilies. By rough count, the journal has at least 7,000 words of text (in excruciatingly small type!) 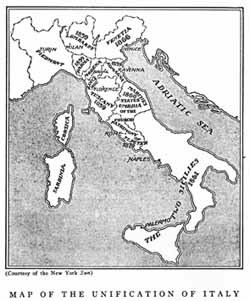 about the beginning of the military campaign that eventually united Italy. All of it is unabashedly pro-unification, pro-Garibaldi, and anti-Bourbon. That would be in keeping with Howard Marraro's observations in his American Opinion on the Unification of Italy, 1846 –61, about the US press, in general, at the time. 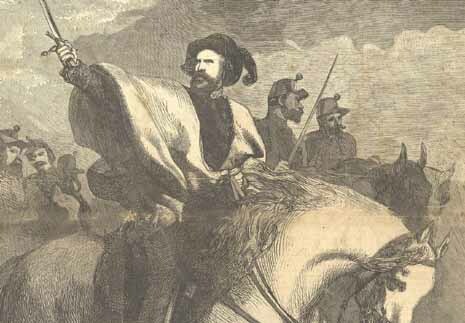 ...Garibaldi may be killed; but if he can hold out a few weeks longer, we believe he will have kindled a flame which all the powers of Rome and Naples will be insufficient to quench. We look hopefully forward to see that glorious country—Southern Italy—purged of the pests and curses which have so long defiled it, and fulfilling the destiny for which it was created, by becoming one of the noblest, happiest, richest portions of the world. ...Fancy a city of some 450,000 inhabitants, of whom 18,000 are priests, 40,000 idlers, 4000 lawyers, and nearly 30,000 prisoners of state, locked up in some of the five hundred and thirty royal prisons! Fancy this city in a state of chronic siege, with the guns of its forts constantly pointed, not upon its enemies, but upon its people! Fancy a government consisting of a priest-ridden king, cruel, treacherous, and false…so miserable an administrator that no department of the government makes the least pretense to efficiency but the police, which has its spies everywhere...Fancy a people systematically trained in idleness, servility, and ignorance; denied the privileges of wholesome education and the use of books; forced to kneel at the feet of the Jesuits, and taught from their childhood that rebellion against their authority involves not only eternal damnation but present punishment; educated in contempt for the laws and indifference to every virtue that can exalt the race! Such is Naples. ...The traveler who walks through the Toledo or Chiaja for the first time…is amazed at the evidence of life and happiness which he sees…Every trade under the sun is carried on in the open street. There are shoemakers and tailors at their benches; scribes inditing love-letters for amorous swains; begging monks proving clearly that all who do not give them a carline will be served up hot in another world; women plucking poultry or cleaning vegetables; quack doctors forcing their panaceas down the throats of peasants from the Abruzzi; cooks roasting and frying at great fires on the sidewalk; mothers combing their children's hair, or turning them up and whipping them; old women on crutches singing airs from Lucia, and old men reciting Ariosto with great fervor; water-sellers bawling iced water; pious minstrels playing doleful bagpipes under a statue of the virgin; Sicilian girls dancing the tarantella with uncommon vigor; friars roaring that they only want a gran more to save a soul from hell; boys fighting for watermelons; exchange tables loaded with copper; lemonade-stands mounted by triumphal arches, bedizened with gold paper and wreathes of flowers; macaroni-dealers ladling huge masses of the smoking delicacy out of cauldrons, and beseeching the crowd not to let it cool; more monks tinkling little bells, and knocking Punch and the conjuror over as they hurry past with a dead man; ladies in Parisian dresses; peasant girls in scarlet rags; lazaroni [sic] in every corner, lying, crouching squatting, running, sleeping, laughing, fighting, picking pockets; and an array of carriages, corricoli, omnibuses, cavaliers, tearing and dashing along at a furious rate, as though collisions were impossible and bones could not be broken.